In a perfect situation, honey bees work throughout the warm months. They collect pollen and nectar. The nectar is converted into honey and stored for Winter. A healthy honey bee colony in a region with plenty of nectar sources should be able to sustain the cold months with their honey. Yet, we often hear of beekeepers feeding bees in Winter months. 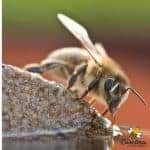 Why is it necessary to assist the bees? There are several reasons that a beekeeper might feel compelled to feed their hives. One is that , in general, our colonies are not healthy. Or at least, not as healthy as they were years ago. Today the honey bee colonies are under constant assault from various pests and viruses. A colony with unhealthy bees will not be efficient at food storage. Another reason to consider, is the strange weather we experience. This is true for my region. We seem to experience wild swings in temperatures and rainfall. Never quite having optimal weather that would promote good pollen and nectar sources. Or, if the bees have access to food, the weather sometimes prevents collection. And sometimes, sad to say, it is the fault of the beekeeper. Through greed or inexperience, a beekeeper may take too much of the honey harvest. Leaving the bees without the food resources to make enough honey before Winter. Honey bees do not hibernate – at least not in the way we think of hibernation. You may see them flying outside on warm Winter days. But, they will huddle inside for warmth when the temperatures turn cold. To understand the importance of stored honey in the hive, we need to understand the survival mechanism used by honey bees. Honey bees are cold blooded insects. While they do not heat the inside of the hive, they are able to eat honey and generate heat. They do this by vibrating their wing muscles. This strategy keeps the cluster of bees alive. But, generating heat requires a lot of food. 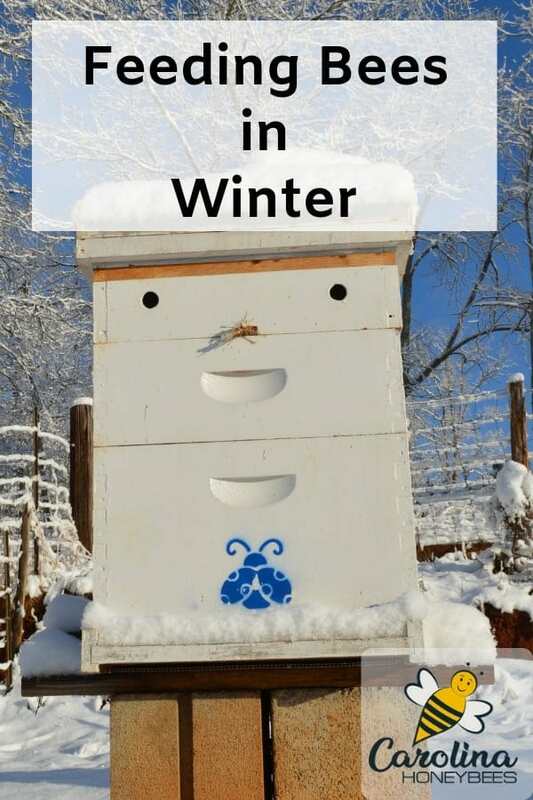 You can read more about how bees survive Winter cold- in this post. If the Summer was exceptionally hot and dry with little nectar, the colony may not have enough honey. This is especially true of smaller colonies. Perhaps splits were made late in the season or a colony swarmed? Also, Winter weather conditions play a role. 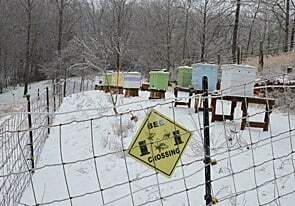 When Winter seems to linger for a month longer than normal, beekeepers must keep an eye on their colonies. In my region, we do not have long, bitter cold Winters. But, I keep a close eye on my colonies as we move through January – February and March. Feeding bees in Winter is not the best approach. It is much better to feed colonies in Fall before cold weather arrives. But our plans don’t always work out in the way that we hope. As a beekeeper, I get worried when I hear weather forecasts calling for record cold. My worse fear is for my marginal colonies. These honey bee colonies have smaller clusters and might survive a mild winter. But, they may not have enough bees to survive low temperatures. Bitter cold temperatures require a large bee population to maintain proper temperatures inside the bee cluster. Yet, even large clusters will die (and quickly) if the cluster loses contact with food. Smaller clusters happen for various reasons: genetics, disease issues, late swarms, beekeeper splits. One method of feeding bees in Winter is with the use of pre-made patties. Most of these patties are carbohydrate based and some have protein added as well. This is only one feeding strategy used. You must be very careful if you live in an area with Small Hive Beetles (who also love patties). In this case, do not put the Winter patties in the hives too early in the Fall. 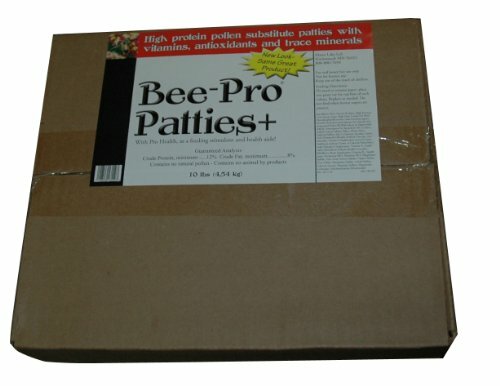 Patties can be purchased from all major bee supply outlets and you can even make your own if you wish. Should You Feed Bees Sugar Water in the Winter? No, I don’t think so. While sugar water would provide food for the bees, it is not the same concentrated resource as honey. And, feeding sugar water tends to introduce increased moisture into the hive. If you live in a region with very cold temperatures, your sugar water may freeze long before it helps the bees. With good foraging conditions, a healthy honey bee colony may have plenty of food stores for winter. Still, sometimes this does not happen. Any colonies that do not have a full box of honey by the first of September needs to be fed. How much honey does your bee colony need for Winter? This will be determined to a large degree by your climate. In my region, a full shallow or medium of honey (in addition to the brood box) is a good average. If a colony is low on stores, I will feed it with 2:1 sugar water before cold weather arrives. Despite good fall preparation, I am always concerned that clusters wont be able to reach food when it is needed. I hate making candy boards and the required rims/shims. Feeding soft sugar cakes combines ideas from several other feeding methods. This emergency winter feeding for bees has been used in my bee yard for years. I call it “emergency” because it can be used any time during Winter. But, the best way to use it is to put it in place on weak colonies right before cold arrives. First I mix pure cane sugar in a bowl with just enough warm water stirred in to make it start to stick together. I also add in a bit of Honey B Healthy (or other feeding supplement) and a very small amount of my honey. Do not use honey from unknown sources. I really don’t measure. Just a small spoon of Honey B Healthy (or your own essential oil recipe for bees) – don’t over do it! Also, I really like to be sure to use pure cane sugar for emergency winter feeding, it is more digestible than white sugar made from beets. It is better to not open beehives during Winter. You run the risk of chilling bees. And, the hard work done by the bees to seal cracks with propolis are undone. My region is blessed with some warmer Winter days, I choose one of these to help colonies at risk. I find the cluster and place a piece of newspaper on top of the cluster – give it a light spray of sugar water . Then, I spoon a large clump of the bee candy mix on the newspaper and close up the hive quickly. I am convinced that this practice helps some of my colonies survive. The first time I tried this process it was a true emergency feeding situation and I hoped it would help some of the smaller clusters survive the record cold. On a mild day after the bitter cold, I was pleased to find the colonies still alive. The honey bees had certainly made good use of my sugar cake emergency winter feeding for bees plan. Emergency winter feeding for bees can help small colonies survive. In fact, I have been so pleased with this method that I now do it every Fall. Just before Winter cold really sets in (mid-late November for me), I put a candy/sugar mixture on each hive. It does no harm and may save a colony of bees that is in transition moving from one box to another during bitter cold. I prefer using wet sugar with a bit of feeding supplement instead of dry sugar. It is okay to use dry sugar but I find that the bees sometimes throw it out of the hive! They do not seem to do this as much with my soft sugar cakes. It is important to remember that this is an “emergency winter feeding” option, it does not remove the need to ensure that your colonies are well fed in late Fall. a very interesting and enjoyable article. I never realized that bees were such a needed species. I have a new respect for them. Thank you for your part in the preservation of them. Thank you Sheryl, Bees are one piece of a pretty big pie! I hope you will share my post with your friends. Thanks Charlotte. I will definitely give this a go. You are welcome. It doesnt work everytime but I think it helps. Hi Charlotte! I’m very concerned about my struggling hives and this cold snap coming in. Tomorrow is supposed to be 60 degrees around 2. Should I “emergency feed” my hives to get through the next couple days? I thought about bringing my hive bodies down to 1 box as well, except for the hives that have brood and higher population of course. I really need some guidance. Well, that is not easy to say. 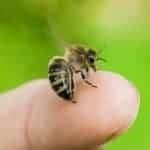 BUT, if you colonies are small and you are concerned that they do not have enough honey near the cluster.. then yes, I would. I really enjoyed reading your article. What is harsh weather? I am from California and now live in Georgia where I plan to raise honey bees. Georgia is harsh considering Northern California weather. What do you consider harsh and in what temperatures can honey bees fend for themselves without concern from their beekeeper? Hi Matthew, Healthy well prepared honey bee colonies usually do quite well by themselves. However, it’s those marginal colonies that I worry about. For myself, I worry a bit when temps dip into the teens.